Instead of a country deciding how many immigrants should come, why can't we have a system where the municipalities decide how many immigrants they are willing to accept, and then the total amount of immigrants to a country is decided by the sum of immigrants to all the different municipalities. Also, since the immigrants have gotten a permission to come to a certain municipality, they need to stay there for a certain time before they are allowed to move to other municipalities. For example 5 years. I think this will be a much more harmonious system, since municipalities know much better how many immigrants they can handle (or are willing to accept). some municipality administration offer spaces, but their inhabitants don't like it. And vice versa (sometimes simply because there is no space). Some municipality offered space and housing, but the state said no (not meeting standards,...). Or some municipalities even offered grade 1a spaces, but the immigrants did not want to go there, because it is not Berlin (or similar reason). Some immigrants simply do not wish to go to "backwater" towns int he far rural areas. And the state-wide political will may be different than the sum of local wills. Feedback is necessary before promising out-of-reach numbers, but the state sets the general guidelines, and political fairness requires that all support the same goal accordingly. The system will not work if some cities are pulling far-above average wight and costs, while some municipalites simply close their books and say "No". So you would also need to adapt a cost-transfer system. Some states in Europe implemented mixed systems in that regard. The towns got a target range. If below range, they had to pay, if within the corridor, all was fine, if above, they received money from the pot from those who did not meet their lower target. Also, your proposed system would take too long to be implemented. There are now 5k immigrants standing at your border. Then you go and ask all municipalities "how much can and will you take?" This process takes one to two months. Then adding it all up, forming it into a national expressed will, and those 5k immigrants have either gone away, became illegal in your country, or even multiplied to being 50k immigrants at your border. The last one requires you to redo the exercise. NOTE: my answer is a gross simplification of the issue, and formulations. Of course I do not think that the 5k immigrants at the border themselves multiply to become 50k immigrants, I meant that the group of immigrants at your border increased from 5k to 50k (through new immigrants arriving) while you were running through the political process and the forming of a political will. I think for the USA, the bigger problem is that we're really not set up to restrict freedom of movement within our borders. I think this will only lead to municipalities defining their own rules for immigration . But won't it be more democratic if the mayor of the municipality has been elected by the people living in the municipality? I know, but it is not like they are the ones who can make demands here. If they don't want to go to where they are accepted, can't they just go back to where they came from? I agree with Death999, it infringe on freedom of movement. You would have to split it up to countries and not call it municipality. I am in the opinion that there should be as many countries as possible for as many groups of people who get along together. I think a country with too many groups or Demographics who don't get along together is not really healthy. Sometimes it's better to just separate people who get along fine together(with the separation being a country not segregation) into their own country. Are we going to make everyone get along together under one big country? Or is it better to separate groups of interest into separate countries who are both strong and independent and both respect each other? Do you really think everyone on the planet can get along under the exact same terms? Or maybe different people need different conditions or terms to live by? Sure, beggars cannot be choosers. But that's not how Humans work. They come here to carve out a living they want. If you send them off to far rural areas, they feel cheated and will move where they want without telling the authorities. This does happen in Germany. It will not work. Even if those rural areas have more work and more perspectives for them than the anonymous capital city. Can't we just have it so that they need to report once a week to a person in the rural area where they should be living? And if they get caught moving away, they risk getting thrown back to where they came from? Or at least get a fine. Of course, I don't think this sounds entirely fair for the immigrants. But it might work better than the alternatives... This is a very complicated matter, since humans are so damn xenophobic. Several things have been tried by German authorities. And threatening with sending them back will also not work. Those people risked their lives to come here. They will prefer to live "in the shadows" illegally than risk being deported. So they will cut all ties to authorities. Modern communication and mobility makes this approach impractical. It was very practical and working int he eighteenth century and before. But today, no. You'd have to build fenced camps. And even that will only limit those who are okay with being limited. Zanthius, is this about people coming to a country for work or people coming to a country seeking asylum because they live in a warring zone? These are 2 different things and many people confuse these . I think we already have quite good systems for work immigrants, especially if they are working with something that requires some education. It is the refugees we have problems with. Anyhow, it might also be somewhat different between Mexican immigrants in the US, and Arabic/African immigrants in Europe. I think we have much bigger problems with immigration in Europe. I think the municipality deciding makes it so that you have different laws everywhere that accept them or reject them. It is simply an impossible idea. The current refugee situation is such that to get to europe, refugees have to pay smugglers fees to get on boats. So the people arriving in europe are the richest portion of the people in Syria. They tend to be male and educated. Children. women and older people are left behind. The european cost of housing is really expensive compared to the cost in the middle east, so with the same amount of money you can help way more people and help them in a more fair way. I am thinking that maybe "a desire to help mankind" should be above self-actualization, or maybe replace the self-actualization category with "a desire to help mankind". What do you guys think? During times of injustice, some individuals or groups courageously resist maltreatment of all people, regardless of backgrounds. 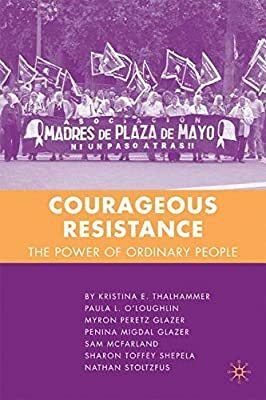 Using various case studies, this book introduces readers to the broad spectrum of courageous resistance and provides a framework for analyzing the factors that motivate and sustain opposition to human rights violations. I think it would fit within that, not above it.